For most of us, all of those key ingredients make up our Thanksgiving weekend, but this year, why not add in some engagement that doesn’t normally occur around the family table? Let’s really make our moments matter. Engaging in meaningful family discussions around the table is one of the things with which I am passionate. Yet I understand that often the busy aspects of life stand in the way of making that happen. Around Thanksgiving time, many families spend their time focuses on the TV, sales and football. We do some of that as well, but we also slow down and have a blast engaging in meaningful conversation. Don’t let this Thanksgiving get by with out learning a bit more about your Family Story. See what we did last year in “Do you know your family’s story?” Find out how we intentionally used our family time to make a generational difference by engaging in meaningful family discussion. 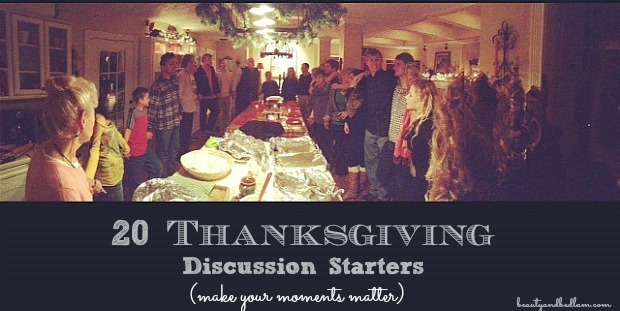 Here are some Discussion starters to help your family mealtime. I know this will be one of your best Thanksgiving meals ever. Remember, it’s not just about perfect food; it’s about family, friends, and wonderful conversations. So, get to know them better by picking just a few discussion starters to get the ball rolling. You may cut these up and pass them out. Why not share that you are going to do something a bit different during dessert and give this a try. Express thanks to someone in the room for something they did for you. “I’m thankful for…” Finish the sentence. If you could have the attention of the whole world for 30 seconds, what would you say? One thing I’m thankful for about our country. “I got in so much trouble…” Tell the story! This question is always a hit with the kids. What is the key to success in life? Why do you say that? Tell about a lesson you learned the hard way and how you are thankful for what it taught you. What are some ways life is different now than in the old days? Tell a story of a decision your ancestors made that changed the direction of their lives-and yours. Tell about a lesson you learned by watching someone else. Tell about an experience that changed you for the better. Tell a story about something that started out bad but had a happy ending. Tell about a time when you showed courage. Describe a teacher who had a significant influence on your life. Tell about an invention that made your life easier. “The most admired public figure when I was growing up was ____.” Tell a story. Tell about a memorable event in your life. “A famous person I’ve met is _____.” Tell about the experience. After I wrote this post, I saw the need to take our dinner time tradition to the next level and share it with you. A free Conversation Starters Gift for you. Click on over to that blog post and receive 240 dinner time questions with free printables so that you can make your own special gift for someone else. Happy Thanksgiving to you and your family. Thank you for being an amazing role model. I love to visit your blog, and today I am thankful for you. Thanks for the great ideas, Jen. These are really great ways to keep the focus on the relationships, and not just the food.